Jus Tin. Impressive questions that you can ask in a job interview. This is the title of this podcast. This is part two. We, we went through questions one through four and we went a little bit long. So we, we broke it up into two parts. And so what we’re always trying to do is add value to job seekers and employers when it comes to topics like interviewing. And we have so many questions all the time, that Ph that our candidates come and ask us, we believe that this is going to be able to help anyone who listens to it. So we’re always trying to bring good content and you can see all of our content on our website. If you go to our website and go to our career center, our podcast is located there. Please invite anyone that you know of that’s looking for a job or that could really use some insight on how to, uh, work on their interviewing skills and become much, much better. That’s what we’re wanting to do here. Um, so this topic I believe is going to be really important for people because most of the best candidates are not interviewing all the time and learning and understanding impressive questions to ask in a job interview is always a great way to show your intellect, show your interest, um, learn more about the position so you can make a better decision for yourself. Remember, you’re going to be spending like so much more of, more time at this position than you will with your family. And so, I mean, by all means, let’s make sure that this is the right position for you. You’re only going to be able to do that by asking good questions. And so let’s dive into this. Staffing agency Tulsa, we, we talked about some statistics just about general interviewing. Um, let’s go ahead and kick it off with that, Ethan. The type of questions that you’re going to ask, it’s going to say a whole lot about your, um, your enthusiasm about the job. And that really falls into soft skills. We felt like, Oh yeah, it definitely does. And again, it’s so important. I mean, those stats are pretty staggering when you realize that, you know, 93% of those employers say that it’s, you know, the most important thing they’re looking for in an interview. Staffing agency Tulsa, but it’s super true. One of my favorite quotes, we, we’ve talked about it before, I quoted it last time, it’s by Peter Schulz. It says, higher character and train skill. You can really train people to do almost anything. You know, and when I came into recruiting, I’d never done it before at all. And, um, and, and, and yet they still decided to train me on, there’s a great quote by Lawrence, a Bossidy that says, I am convinced that nothing we do is more important than hiring and developing people. Some of the top, you know, top 500 companies that that are around, these are some of the hiring strategies that they are implementing. And so if you’re going to go and get a job at a company that is really well versed in interviewing, um, you better be well versed in this particular skill. And which is why we’re going over this today. So let’s, let’s dive in to question number five. You want to go out and read that up for us is your, yeah, of course. Number five, a really good question to ask at the end of an interview is what are you hoping this person will accomplish in their first six months or in their first year on the job? And that’s great. I mean that question kind of gives you a sense of what, what kind of learning curve you’re expected to have. 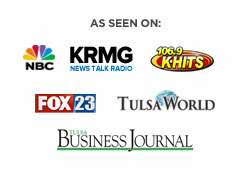 Staffing agency Tulsa, and as well the pace of the team and the organization. But I’ll tell you what, we in sales, I asked this question all the time when we get a new job order, especially from a new client, that we are unfamiliar with them. Um, and I always want to know, listen, what were some of the things that people did before previously where they just crushed it? And let’s, let’s go back and let’s explore and seek to understand the person that was the most successful in this job previous. And let’s try to duplicate that. What was it that you liked? What were some of the things that were great? And when we understand that as recruiters, it helps us to do a much better job that this is a great, great question. It’s one of the things that helps us to win, succeed and, um, and perform well for our clients. Yeah, definitely. The next question we got is, how would you describe the culture here? And we don’t want to bring someone in like that. Yeah, absolutely. Um, our next question is what do you like about working here? Um, you can pay attention to body language here. Staffing agency Tulsa, and you can tell if someone’s really trying to dig things up or not. Think about it for 10 minutes. You know, one of my favorite questions when people ask really why? Well, because I’m naturally an optimist. I like to, I like to be upbeat and joyful about things. And so when people ask this, I just get to, I get to talk really great things about where I work and it encourages the person who’s looking for a job. And then it also kind of oddly encourages me cause then all of a sudden I’m sitting there and I’m thinking about all the great things about my job that I really enjoy. It’s a nice thing to learn because you want to know those good things going into, you know, going into an interview, you want to know the good things about a company and I’m from the inside, you know, inside perspective. Um, we just gave you 10 questions. I do not think that she, you should go into an interview expecting to ask all 10 now if you were are looking, we have spent 27 minutes just going through the questions ourselves, Staffing agency Tulsa, in, in both parts of this. So pick out these questions, know them all, and based on how the interview goes, um, pick out two to five of these and ask and you can read your interviewer. And when, when it’s, when it’s time to wrap it up. Go ahead and wrap it up, but I think that these can help you. I hope that they did. If Trinity can help you in any way, please give us a call. You can call us at (918) 622-2588 visit us online@trinityemployment.com we’ve got this podcast, a lot of other information and great stuff. We hope to see you. Thank you so much for listening in.